Personalized and custom printed in gold ink on an all-black Ordination Wallet License. 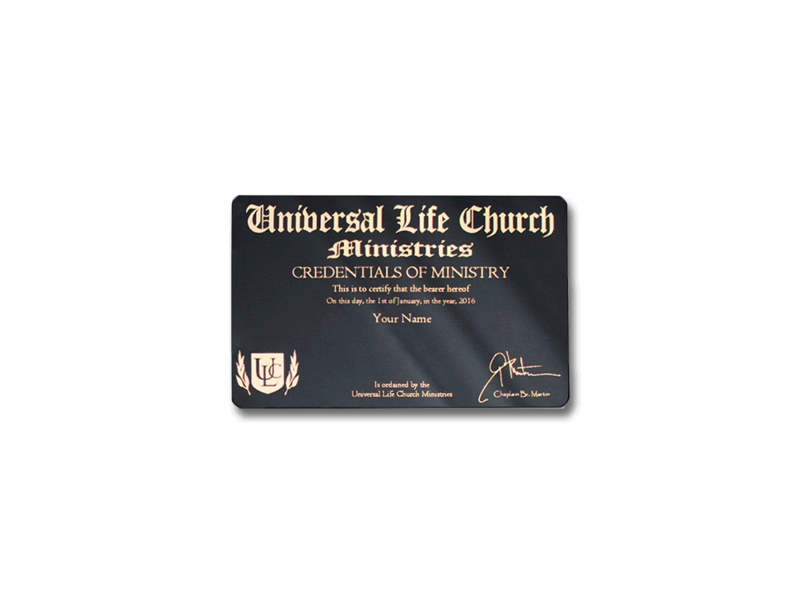 This is a minister license you can carry around with you in your wallet. Carry your credentials of ministry in your wallet with this credit card sized copy of your ministry license. We custom print each card with your name and ordination date in gold foil on our deluxe black plastic credential card. If you plan to carry this card with you all of the time, please consider purchasing the additional protection of the plastic wallet card sleeve to keep the gold lettering like new. Please enter your legal name only, all titles will be removed. Please verify the spelling of your name as it will appear on your official documents. If you are performing a wedding, you may be required to purchase a Letter of Good Standing as well. Weddings in Nevada and New York City require a special state package, not this product. Click HERE for shipping and return information. If this wedding is being performed in NYC there are a few more steps to make it legal.